Our Premier and Prime Minister are in Copenhagen claiming to work toward a global climate treaty, yet at home they are paving farmland (90 hectares of the best farmland in Canada), paving Burns Bog (the largest carbon sink in the Lower Mainland), and paving the banks of the Fraser River (endangering the most important salmon-bearing river in North America). 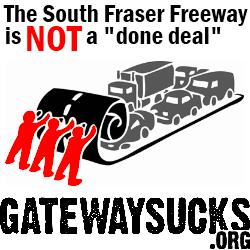 Even the government’s own studies say that the Gateway freeways will increase GHG emissions by over 160,000 tonnes per year, over 11 times the claimed reduction for the $2 billion Canada Line. I love this blog. It has the best action videos and twitter tweets. Keep up the good work. PS the snow is cool too. how come it is shut off?